In what’s becoming a trend, another set of devastating natural disasters made headlines in 2013. Typhoon Haiyan enveloped the Philippines in November while the world watched online, and less publicized but just as traumatic, flash flooding in India this summer killed thousands of pilgrims making their way up Himalayan river valleys. Meanwhile, the environment has played a much less dramatic but no less important role in the conflict in Afghanistan. We heard from researchers there pushing for better understanding of how natural resources affect tensions and can inform peace efforts. And in East Africa, we heard about what needs to be done to prevent the “resource curse” from following the coming wave of oil and gas development. In these contexts and others, many dynamics affect vulnerability and resilience. Demography remains one of the most important. The UN released their bi-annual update to world population projections, which included the third straight increase in mid-century global population and important new data on sub-Saharan Africa’s continued growth. NGOs and governments continued their work to prevent child marriage, which affects the lives of so many young girls around the world. And the importance of urbanization grew as well, as new cities emerge at a torrid pace and policymakers grapple with making them functional. The question of how India and China, in particular, balance their rapid growth with environmental concerns proved a major draw, with several posts among the most popular, including from the Wilson Center’s China Environment Forum. Thanks for reading, and especially for your many great comments and contributions – we look forward to many more! 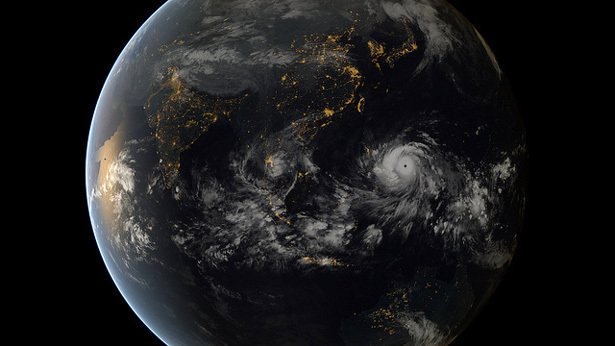 Photo Credit: Typhoon Haiyan approaches the Philippines on November 7, copyright 2013 JMA/EUMETSAT .